An Intrepid-class starship built primarily for deep space exploration and combat performance. Topping out at Warp 9.975, it is among the fastest starships ever built. 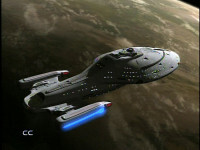 Armed with advanced weaponry and technology, Voyager is also one of the most advanced starships in the Starfleet lineup. 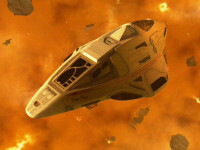 Faster, stronger, and larger than a typical shuttle, The Delta Flyer was built to better tackle the unique challenges of the Delta Quadrant.